Attention all 10U and 12U players! We will be holding our annual Prospect Camp where incoming players will experience age-level appropriate skills and drills. Cost of the camp will be $40. A registration link will be available soon. We are excited to offer the opportunity to participate in an off season skills camp to help prepare your player for the upcoming season. We will have two sessions available to split the athletes into two groups. Please remember this is not a learn to skate opportunity and if you child is unable to keep up with the group they may be asked to leave the ice. The cost of registration is $200/mth. We will fill the sessions on a first come, first served basis and create a waitlist once the session has filled. If you have any questions regarding what the clinic will entail please contact Wayne Atkinson at secretary@sanantonioyouthhockey.com. The 2nd annual Jr Rampage Golf Tournament has been postponed due to weather. We are confirming with the golf course for early April. If you have any questions please contact Erik Patek at erik.patek@att.net. To register online, click the link below. If you do not wish to register online, download and complete the flyer and email to erik.patek@att.net. 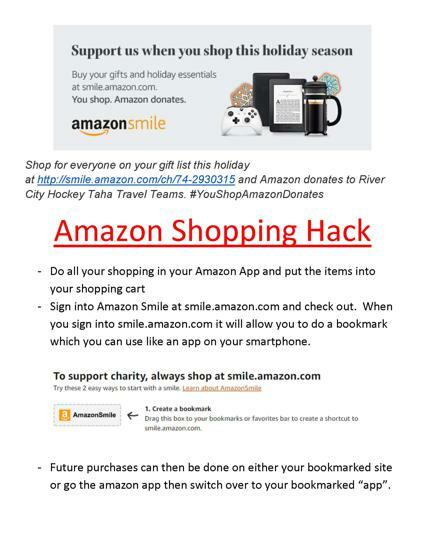 Shop for everything on your list today at SHOP HERE and Amazon donates to River City Hockey Taha Travel Teams. Please follow link to see all the options available through Northwoods including Learn to Skate and Play Hockey. San Antonio Youth Hockey is also on Facebook. Check out our page and LIKE us to get the most up-to-date information, photos, Jr Rampage and local hockey news! Need Jr Rampage Car Decals? Bag Tags? Where Can We Get Personalized Window Stickers? Display your Jr Rampage spirit on your car window. Claim your hockey bag with a personalized bag tag, New helmet? No problem - order numbers and helmet stickers whenever you need one! Tag Sports Graphics is the Jr Rampage source for all of these spirit items. Click link here to order! Your items will come directly to you and can be ordered at any time in any quantity.